On Sunday 4th July 2010 around 7,500 cyclists of all abilities took part in the annual ride from Manchester to Blackpool in aid of The Christie charity, in particular the Christies Cancer Hospital and oncology research. Taking part this year was member, and regular cycle event attendee, Nick Thompson and our steward Richard Porter, shown right with their certificates. 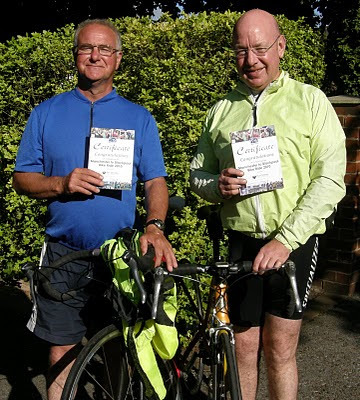 The day's journey started at Old Trafford, onwards to Leigh, then through Standish, Chorley, Preston, Warton and finally Lytham St Anne's before riding up the coastal road to the finishing line at Blackpool’s Mirror Ball on the South Promenade. This year's event delivered an interesting mix of weather conditions. After a relatively easy, dry and warm 40 miles to Preston, the heavens opened to cool down our dynamic duo. Unfortunately this coincided with a viscous increase in wind strength, making the final 16 miles a gruesome struggle. Despite the weather the pair not only achieved a very respectable time of 4 hours 30 minutes, including a couple of refuelling stops, but also revelled in overtaking a series of muscle bound and professional looking cyclists on the final stretch. Richard even managed to visit a local pub on his bike in the evening, before loading the trusty machines on the wagon and boarding a coach for the return journey. Plans are afoot to enter next years event, maybe with even more members, hopefully raising more money for this fine charity.